Lachlan Macquarrie was born on 31 January 1762 on Ulva, off the island of Mull, in the Inner Hebrides. He joined the British Army in 1776 (aged 14) and served in Nova Scotia as well as New York and Jamaica. 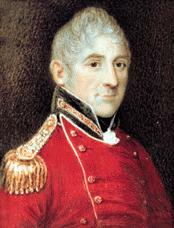 As a lieutenant he served in India from 1787 to 1801 and later in Egypt where he was involved in defeating the army of Napoleon. In 1810 Macquarrie became Governor of New South Wales at a time when it was still being used as a penal colony. The previous Governor had been Captain Bligh of the "Bounty". Macquarrie followed a policy of encouraging the former convicts to settle in Australia - despite opposition from the "free settlers" who wanted to retain privileges only for themselves. Australia would be a different place if he had not succeeded. He transformed Australia into a thriving country and Sydney from a shanty town to a Georgian city and is regarded as the "Father of Australia". He left Australia in 1822 and is buried in a Mausoleum on Mull. You can read more about Lachlan Macquarrie at the web site at the Library of Macquarie University, New South Wales.